In the previous tutorial, we talked about the required tools for Android Application Development and also listed out steps to configure those tools onto our Computer. Now in this tutorial we'll shed some light on the Android SDK manager, how it is important for Android Application Development and what packages you require to download to start with android app development. The Android SDK Manager, manages various Android SDK versions, tools and various other useful packages that you can select and download, to keep your development environment up-to-date. 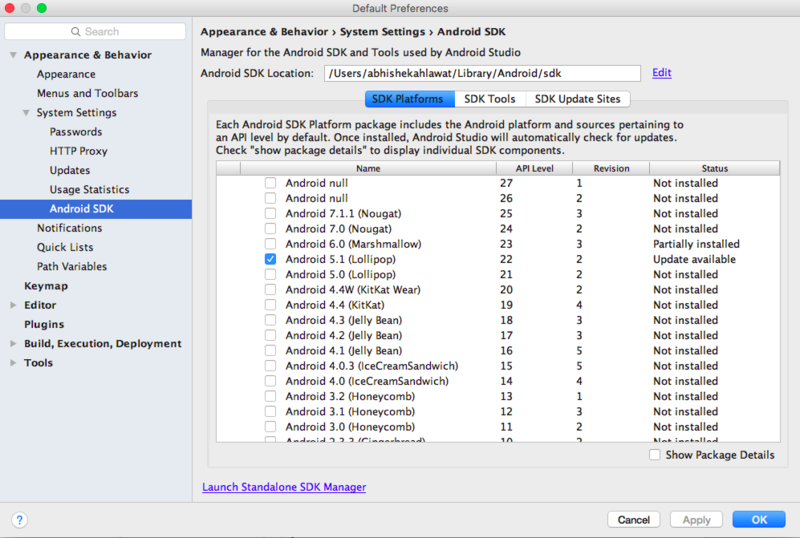 Generally when you launch the Android Studio for the first time, it will open the Android SDK Manager window, to prompt you to install the required packages for android development. But if that does not happen, you can open the SDK Manager by going to Tools → Android → SDK Manager or click on the icon in the Android Studio toolbar. Launch your SDK Manager, and you&apos;ll get to see the list of currently installed items. It will also list all the new items & Updates available for already installed items for your system. From here, you can check the required Build tools, SDK Tools, Platform Tools, SDK Platforms, Samples for SDK, System Images (for AVD), Documentations, Sources for Android SDK and Extra Packages for your development. It requires internet connection to download the packages (most are of large size) so make sure you have one. 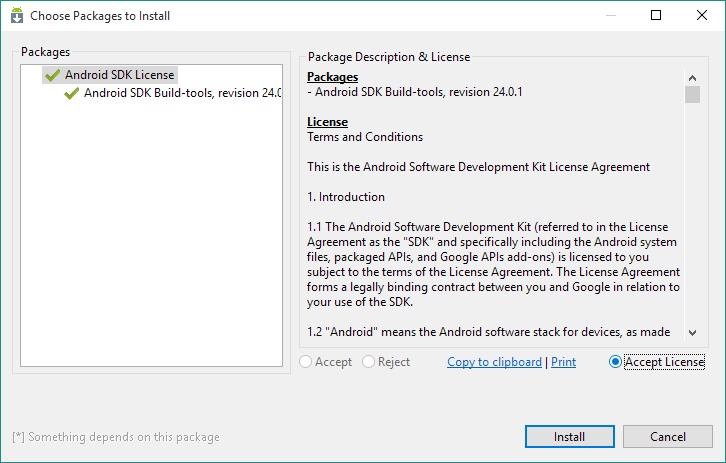 SDK Tools and Build-tools contain packages to build your Android Application and several updates/patches from Google for better Application Development. SDK Platform: Android SDK platform contains packages/libraries to develop & build Android Application for specific versions. To compile your Application against specific version, to load specific widgets, views and tools for compilation, is done by SDK Platform. Hence, whenever you want to download packages for any new Android version like 8.0 or 7.0, always select and download SDK Platform for it. System Image: To create an AVD(Android Virtual Device) for any specific API, you should download a System Image as per your system type (either 32-bit or 64-bit OS). For Android Smart Phone, Wear & TV, separate images are required which are also available for downloading. If your application is working with some play-service features like Google MAPs and all, then to test your application with them, you&apos;ve to download Google API System Image as well. Optional Packages: Samples for SDK, Sources for Android SDK & Documentation for an API level are optional. SDK manager also lets you download few samples for any particular SDK platform and Source for API level. If Documentation is there, you can download the documentation that contains information about specific classes and methods for that API level. If you require them, then you can select them for download else don't. Scroll down in SDK Manager, and you will see Extras section, which contains additional packages/libraries/services that are required/helpful for application development. You can download, if you think you need any. As of now, we advice you to ignore them. We hope you&apos;ve selected your required tools and packages to install, click on OK or Install. This will open another window as shown in below image, select the Accept License radio button and then click on Install Packages button in the lower right corner of the SDK Manager window, this will start downloading your selected packages. The installation will take time, so be patient. You'll be asked to restart the ADB when all packages get installed in your system, Click YES for it. It lets you download your required Android Version Packages and Tools for Application Development". We will learn about Android Virtual Device in upcoming tutorial.